20 Minutes and a Beer! 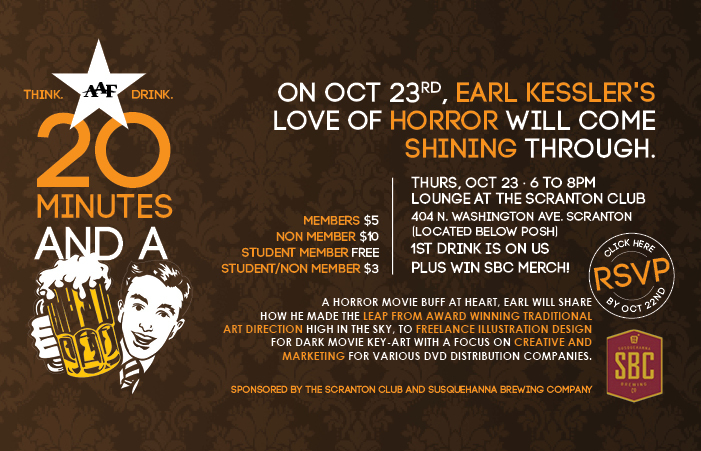 This Thursday, October 23, the Northeast Pennsylvania AAF 20 minutes and a beer will feature Earl Kessler! Earl will share how he made the leap from award winning traditional art direction high in the sky, to freelance illustration design for dark movie key-art with a focus on creative and marketing for various DVD distribution companies. 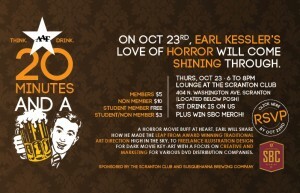 This event will be held from 6 to 8 PM at the Lounge at The Scranton Club. There is a small $10 entrance fee for non-members and a $3 fee for student non-members. Attendees must be 18 or older. Stop by for some inspiration and a free beer!